This is a ride that will probably be familiar to most riders in the Auburn and Sacramento areas. You may encounter this ride being described as one of the favorites of the area, and it's been on my radar as such for years before I've actually tried it out for myself. It's not difficult to see the source of its appeal. The route features a high ratio of fun singletrack (when started from the side that I did); there's great river scenery to be taken in over a significant portion of the mileage; it can be done as an out-the-door ride by most residents of Auburn; there's a fun and partly technical descent in the mix; and the route provides opportunities to extend your ride easily by many more great singletrack miles. Naturally, the part of this ride that truly deserves the moniker of "Lake Clementine Loop" is the looping part of the route. Different riders like doing a "Lake Clementine Loop" ride by including this core loop in different ride routes. One of the most popular variants involves approaching the loop via Stagecoach Trail (and other fire roads) from the west, since this allows you to pedal your way to the loop directly from Auburn. One potential drawback of doing the ride that way is that it will involve significantly more climbing (on your way back) than what you see represented on this page, as long as you're not being shuttled. For two specific reasons, I found it preferable to get to the core loop from the east as you see here: (1) it adds the great singletrack mileage on Connector Trail (times two) to your route and (2) it allows a seamless extension option onto the Foresthill Divide Loop regardless of whether you may want a lot more miles or just a few. Speaking of "the core loop", you can do much shortened versions of this ride if you prefer to do so. One option would be to start from the intersection of Lake Clementine Road and Foresthill Road where there is a small amount of roadside parking available. I don't know if this is technically legitimate parking but I have seen people park there. This would give you a tiny little bit of Connector Trail as well as the full loop as seen on this ride route. 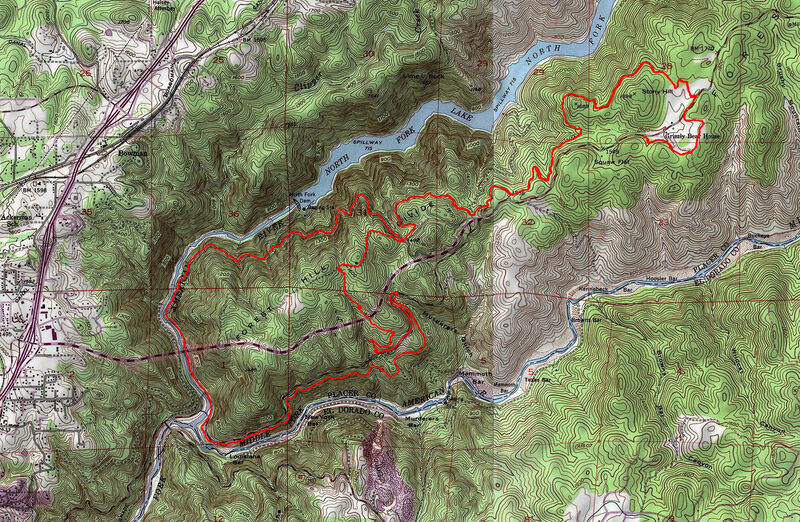 Or you can start from the exact beginning of the loop itself at the junction where Lake Clementine Road, Connector Trail, and Fuel Break Trail meet, where you will also find a small amount of roadside parking spaces available, to do just the loop and nothing else. Although, I have to say that much of the fun on this ride is to be had on Connector Trail. So, shortening the ride in this way would leave a lot of that out for you. On the loop itself, the only fun parts are the Culvert Trail descent and the earlier stretches of Confluence Trail, because the rest of the loop proper consists of crowded fire roads (on which there are only a limited sprinkling of interesting and rough parts that are fun) and a climb back out on a paved public road. This is a ride with a lot of reward for not a lot of effort. There isn't too much net elevation change along most of the route and what climbs there are are almost always merciful and moderate in grade. If you don't count Culvert Trail (since you'll be descending it), the only notable segment where you incur a significant amount of net elevation change is the 2.5-mile climb on starting on Lake Clementine Trail and continuing on Lake Clementine Road, and that climb has a very reasonable average grade just under 7%, which is made to feel even easier since 1.5 miles of this is on pavement. The way I've done this ride begins from a paid parking lot of the Auburn State Recreation Area. If you park here, you need to self pay by putting cash in an envelope and depositing it there. The fee is $10 as of 2017. I think of these fees as supporting the parks and trails that I love. But, of course, if you're someone who'd be doing this ride on a weekly basis, you might be of the opinion that love has its limits. If that's the case and you want to look for free options, you will find other gravel clearings further up or down Foresthill Road that you can use. You can also park at one of the starting point options that would result in a shorter version of this ride that I described above. The ride begins on a connector trail that starts right from the parking lot. It does a short climb with a very gradual grade after which you are ultimately taken across Foresthill Road and then to a junction where you connect to Connector Trail on which you turn left and follow this route or would turn right and do the Foresthill Divide Loop. That initial singletrack connector is not terribly interesting, but it's decent. When you are on Connector Trail, some more serious fun begins. This trail, at least the first two miles or so of it that you traverse near the beginning of this ride, seems to be designed for the fun of mountain bikers. It follows repeated minor rollers or small humps, which skilled riders should actually be able to pump. It otherwise continues without any serious elevation change and has only the occasional, minor rock garden or rocky outcrop that constitutes any trail features, which is good enough to keep the interest of seasoned riders without being too challenging for beginners. There's essentially nothing that's difficult on this trail although one or two spots of it are steeper than average and might be places to get off and walk for the most inexperienced riders. The part of Connector Trail after its first couple of miles is not terribly exciting. It becomes a more average hillside singletrack. But it's still nice and fun. I need to point out that Connector Trail has a lot of spots where visibility is very limited. And since it's very popular to ride this trail in both directions and because it can be ridden fairly fast in either direction, it's important to watch your speed and be careful as you approach these points where visibility is bad. You don't want to be going fast in one of those spots and encounter a rider approaching from the other direction who is making the same mistake. So, control your speed wisely and, if you have a bell, use it. I've encountered a little shrine on this trail to someone who must be a fallen rider. I don't know the story behind that particular tragedy, but it looked very much like she lost her life at a spot on the trail that didn't look like it had a terrible drop or an exposed spot. But you never know; all you need for a serious injury or death might be an unlucky collision with an oncoming rider. On Connector Trail, you both climb and descend in either direction and the nice thing is that these don't follow each other in very short stretches. They are slightly more extended segments, so that when you're traversing a downhill portion you're not necessarily always still panting from the last climb that you did. You get a chance to catch your breath and enjoy the descent over a slightly more extended duration. After Connector Trail, you follow Fuel Break Trail, which is a fire road where you spend most of your time climbing. Although the very beginning of the stretch that you cover on this ride begins with a discouragingly steep grade, the trail mellows out almost immediately and the rest of the distance you ride on Fuel Break is of quite moderate grade. The grade is somewhere approaching 15% near that very beginning, but the bulk of the climb on Fuel Break Trail takes place at a slope not much above 10%. Your short stint on Fuel Break Trail ends when you reach Culvert Trail, which marks a return to singletrack for this ride. This trail is a clear and distinct descent and it's a relatively aggresive one. It begins with a series of fast and well banked curves sprinkled with more rocky trail features than you find on Connector Trail. And when the trail passes under Foresthill Road through a large culvert, you immediately realize where it gets its name from. This culvert is one that is short enough to see the other end clearly as you're entering it but it's not so short that you'll have enough light in it to see what's right in front of your tires. It's almost worth having a light on your bike to show your way, just to avoid any potholes or ruts. I didn't encounter any; but toward the exit side, the trail was moderately rutty around its center. Between its crossings of Foresthill Road and Old Auburn Foresthill Road, Culvert Trail becomes a bit more technical. It continues its pronounced descent although maybe with a bit less gusto. However, rocky trail features proliferate more, and a few of these are actually of black-diamond difficulty, although they all have bypasses. I saw at least a couple of them that can be used as launch points for jumps. By the way, even if this trail is not formally called that, it's the closest thing to a flow trail that I've seen in this area. When Culvert Trail reaches Old Auburn Foresthill Road, you'll notice that the ride route follows an elongated extension up the paved road to catch another trail segment at its beginning. This is just an optional extension that I've noticed some riders prefer, and it's aimed mainly at riding Stone Wall Trail. This trail is an okay addition to the ride, but it's not a must-have. It's not really a true singletrack although some of its parts closely resemble one. It's a fun and fast descent without too many twists and turns, and it does give you an upfront look at the Cave Valley quarry on the other side of the river, as well as a couple more up-close views of the water, but nothing better than what you'll get later on Confluence Trail and Lake Clementine Trail anyway. So, if you are looking to maximize your mileage, it's a worthwhile addition. The road part of the extension is mostly uphill but is of a very moderate grade and is no big deal. But, otherwise, if you're short on time or energy, this extension can be easily left out without missing out on anything. When you reach Confluence Trail, the scenic part of the ride begins. I got the distinct impression that this trail used to be an old road that follows the river. You can even encounter patches of remaining pavement in some spots on the trail. But it's interrupted by many short singletrack stretches negotiating brief rises that are fairly rough and could be techy. My guess is that these are all the spots where the trail had to negotiate slides that have happened over the years and I'd say they are a very nice and fun addition to the trail today and they help the trail avoid being boring. This trail provides frequent views of Middle Fork American River and is often accompanied by the sound of white water. I should also add that some of those techy bypasses on this trail are at spots on the hillside that are fairly steep (so no wonder they experienced slides, I suppose) such that, when they're narrow enough, the drop off on the downhill side could be a little intimidating. Some of these are fairly exposed, actually, and might be scary for greener riders. I would recommend getting off and walking at any spot that makes you feel skittish. As you reach the actual confluence point of the Middle Fork and North Fork American River on Confluence Trail, you'll find yourself arriving in a crowded area where people making recreational use of the beaches and the river are congregated and parking spots are hard to come by. At least this is the situation you might find on a nice weekend, of course. Here you cross Old Foresthill Road and continue on in the direction of the Foresthill Bridge, which is billed as the highest bridge in California (730 feet). The continuation of the trail on the other side of the road, which is Lake Clementine Trail, initially starts as a wide promenade full of casual walkers. Before too long, however, you begin to encounter short stretches that are very narrow and often bumpy and technical on this trail as well, which I also attribute to places where the road was covered or washed away due to slides, since the wider trail resumes after these and ultimately continues on as a fire road until you reach the paved Lake Clementine Road. As you get closer to the point where Lake Clementine Trail will veer to the right and start heading eastward, you begin to gain elevation and move higher from the river. This is the beginning of the climb that doesn't end until the point where you complete the loop portion of the route. The good news is that, as I've already explained, it's a very moderately graded climb and it continues to be so even after you reach the end of the trail and you continue on the paved Lake Clementine Road. On the other hand, if you do it on a particularly hot day, of which there is no shortage in this area in the summer months, I'm sure the climb can be uncomfortable enough. Along the way, you pass by the actual dam that holds the waters of Lake Clementine and, at least as of the time of my ride in late May, the waters flowing off the dam looked and sounded like a waterfall, which added a nice touch to at least a short segment of the climb. The ride has patchy to moderate tree cover over almost the entire distance. It's not thick enough to provide the kind of shade that would make it a true refuge on hot days, but it might be just enough to spell the difference between unbearable and tolerable. When discussing Lake Clementine Loop, it's hard not to make any comparisons with the "neighboring" Foresthill Divide Loop ride. One big difference between these two options that stood out to me was the difference in the amount of scenery. This ride provides maybe 20 times (or more) the amount of scenery that Foresthill Divide Loop provides. Foresthill Divide Loop really only begrudgingly allows you a view of the river from one particular spot and only by doing additional work, whereas on this ride, you get to observe inspiring views of the river directly over a big chunk of the mileage. It's also true that parts of Culvert Trail felt more technical to me than what I remember in any segment of the Foresthill Divide Loop. As I've repeated above, an obvious (and very good) extension option for this ride is to continue onto the Foresthill Divide Loop. And that's not even the only choice available to you, though it's the only one with which I have any first-hand familiarity. At the time I write this, I need to leave the exploration of those other options such as Olmsted Loop Trail to you. But I can tell you this much: if you like especially the Connector Trail segment of this ride and would like more such decent singletrack mileage, Foresthill Divide Loop would be a very good choice for you.